A firefighting helicopter filling its bucket from a small pond in the middle of Lightner Creek valley. A fire engulfs an area in Lightner Creek (County Road 207) on Wednesday evening. The fire started with a house and has spread to other areas. The fire prompted evacuations of county roads 207 and 206. A fire near Lightner Creek is visible from the rim at Fort Lewis College on Wednesday evening. The fire started with a house and has spread to other areas. The fire prompted evacuations of county roads 207 and 206. The Lightner Creek Fire can be seen from the southeast side of U.S. Highway 160 west on Wednesday evening. UPDATE: Evacuation center – 9 p.m.
More than 100 people checked in to the evacuation center at the La Plata County Fairgrounds Wednesday evening, Red Cross volunteer Anita Phillips said. By about 9 p.m. about 15 to 20 people had registered to stay for the night. Many people came for information about the Lightner Creek Fire and stayed for dinner donated by HomeSlice Pizza. The evacuation center was accepting pets, and dogs were allowed to stay inside the building. Six horses were evacuated to the fairgrounds and there were 14 stables available, with more expected to open after the rodeo. The La Plata County Humane Society sent crates and pet food to the evacuation center, Director of Animal Services Chris Nelson said. Humane Society officers picked up pets, including seven dogs, in evacuated areas and returned most of them to their owners by Wednesday evening, he said. UPDATE: Apartment complexes prep for evacuation – 8:10 p.m.
Durango police officers are preparing residents of Westwood and Dakota West Apartments to leave their homes. Officers are asking residents to pack their cars with enough belongings for at least a few days. Many residents were standing outside awaiting further instruction from law enforcement around 8 p.m.
Also, Lightner Creek Road will remain closed through the night and it may open at 7 a.m., the Durango Fire Protection District announced. UPDATE: Home destroyed before firefighters arrived – 8 p.m.
Hope Schirard said she called 911 to report the fire at the home about 800 yards southeast of her house but someone else had reported it a minute before, she said. “House went up in flames,” she said. Firefighters arrived 20 to 30 minutes later but by that time it was destroyed, she said. There were two dogs in the kennel at the home and Schirard didn’t believe the dogs survived. Schirard also called the owner’s boyfriend after the fire started and he arrived about 30 minutes later shortly followed by the owner, Christine Polinsky. Everyone evacuated shortly after that, she said. 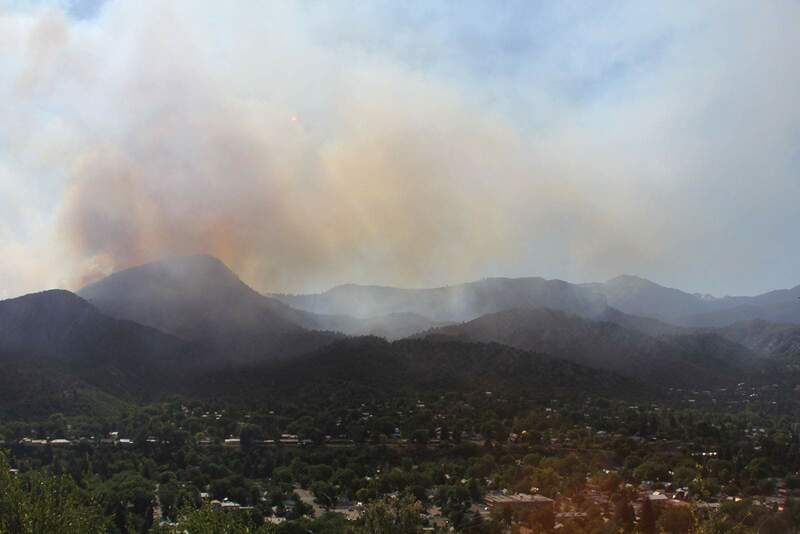 UPDATE: 140 homes evacuated west of Durango; Fairgrounds provides shelter – 7:40 p.m.About 140 homes have been evacuated for the Lightner Creek Fire. The La Plata County Sheriff’s Office has gone door-to-door to inform residents of evacuations, and residents have been notified by the county’s emergency notification system (commonly referred to as “Reverse 911”). Evacuees can take shelter at the La Plata County Fairgrounds, 2500 Main Ave., in Durango, where the American Red Cross is providing assistance and resources. County Road 208Highway 160, one mile west of County Road 207Dakota and Westwood Apartments on County Road 206.UPDATE: Neighbors report hearing three loud booms - 7:05 p.m.Neighbors of the home where the fire started, Jack and Hope Schirard, heard three large booms back to back from Christine Polinsky’s house around 4 p.m., Hope Schirard said. She did not believe anyone was home when the fire started. They thought the sound might have come from a gas explosion, but did not smell gas. Firefighters were unable to confirm a gas explosion, saying the cause of the blaze remained under investigation. The Schirards were the first to arrive at the La Plata County Fairgrounds, which is the designated evacuation center. They believe their home is safe because the fire was moving away from it. There is a rodeo at the fairgrounds tonight, and it is unclear how that will affect the evacuation center. Parking is available at Durango High School if needed. All recreation trails in the Test Tracks west of downtown are closed. These include Hogsback, Leyden and Hidden Valley trails. UPDATE: Fire is 100 acres in size, 140 homes evacuated - 7 p.m. The Lightner Creek Fire is estimated at 100 acres in size, up from the previous estimate of 25-50 acres. Firefighters said people from 140 residences have been asked to evacuate. UPDATE: Firefighters identify home destroyed in blaze - 6:50 p.m.Firefighters said the only home to have burned in Wednesday’s Lightner Creek Fire as of 6:50 p.m. is at 1255 Lighter Creek Road (County Road 207). The property was purchased in 2014 by Christine Polinsky for $831,000, according to the La Plata County Assessor’s Office. The property has a main home and several secondary structures on 4.2 acres. Firefighters are unsure if the fire started in the home, or if it was consumed as part of a wildland fire. 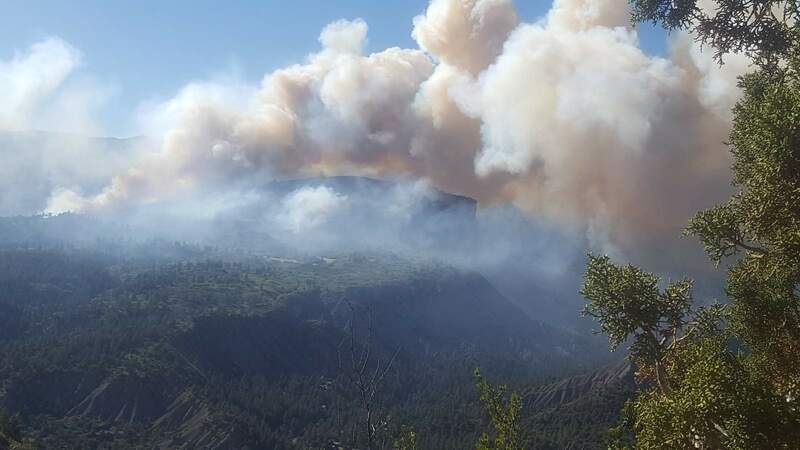 UPDATE: More evacuations ordered west of Durango - 6:24 p.m.Residents on County Road 206 and the Twin Buttes area were ordered to evacuate shortly after 6 p.m. Wednesday. The evacuation did not apply to the Westwood Apartments, which were under pre-evacuation. There are no homes in the Twin Buttes subdivision, but there were construction workers in the area. UPDATE: Lightner Creek Campground evacuated - 6:20 p.m.About 100 guests were evacuated from the Lightner Creek Campground, said Valerie Firth, the camp host. It was a “mass exodus,” she said. Many of the guests rode the Durango & Silverton Narrow Gauge Railroad on Wednesday, and were not around Wednesday afternoon to retrieve their possessions, she said. UPDATE: More hot, dry weather forecast for Thursday - 6:16 p.m.Hot, dry and windy conditions are hampering firefighting efforts west of Durango. Winds were gusting up to 28 mph near the Durango-La Plata County Airport and are likely stronger at higher elevations because of warm weather, said meteorologist Andrew Lyons, with the National Weather Service in Grand Junction. It was 88 degrees in Durango around 5 p.m., he said. Dry weather is predicted to continue for the next few days. “This weather pattern is pretty stagnant; there is not a lot change with it,” he said. A red flag warning was issued until 8 p.m. Wednesday, and another warning will go into effect from noon until 8 p.m. Thursday, the National Weather Service said. Red flag warnings are issued when fire danger is particularly high because of wind, high temperatures and low humidity. UPDATE: Firefighters not sure how blaze started 6 p.m.Firefighters were unsure if the Lightner Creek Fire started as a house fire or as a wildland fire. The La Plata County Fairgrounds has been opened for residents who have been evacuated. 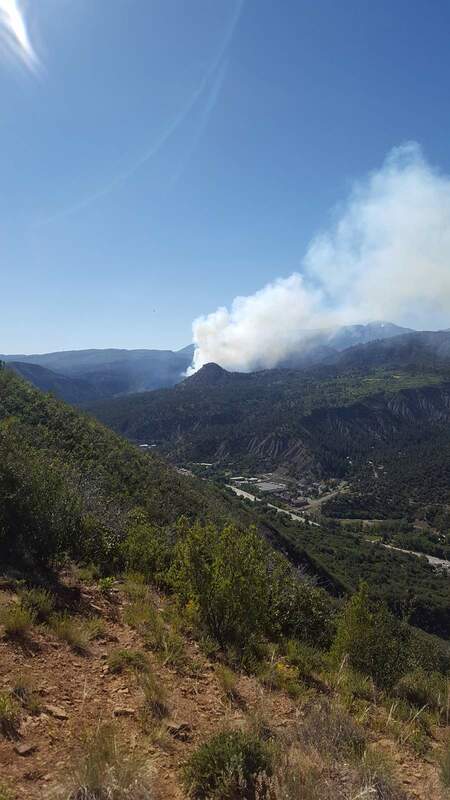 UPDATE: Fire is 25-50 acres in size, incident command team to help – 5:45 p.m.The Lightner Creek Fire was 25-50 acres in size, according to the Durango Fire Protection District. Three heavy air tankers are en route from Denver to help slow the spread. “Fire behavior will continue to be effected by high air temperatures, low humidity and high winds,” according to the fire department. A federal incident command team is also being assembled to assist. UPDATE: Two fires, residents plead to save pets – 5:30 p.m.Firefighters were battling two distinct fires in the Lightner Creek area. 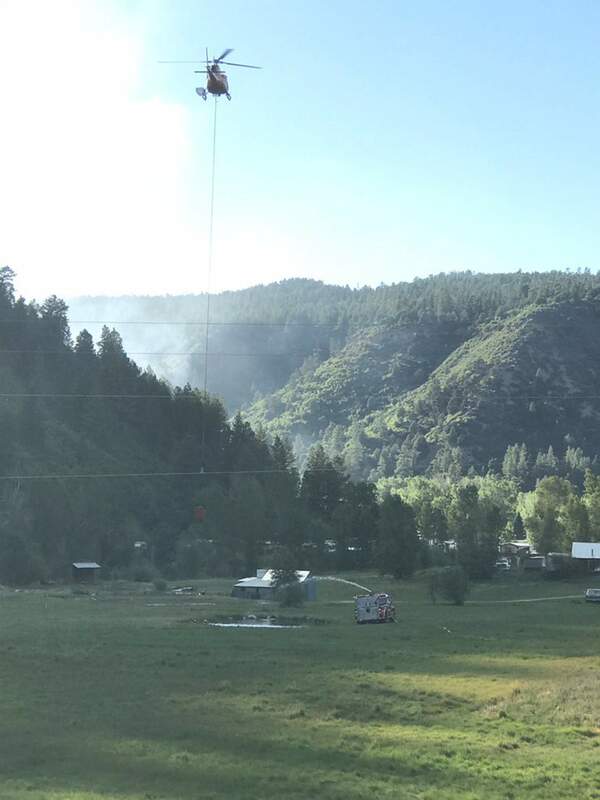 The first appears to have started as a house fire that spread to the wildland and headed south down Lightner Creek canyon. The second fire was about three acres in size and burning east of the initial fire. It was unclear if the first fire sparked the second fire. No one is being allowed to turn onto Lightner Creek Road (County Road 207) from U.S. Highway 160. Some residents were visibly upset about not being able to return home for pets. 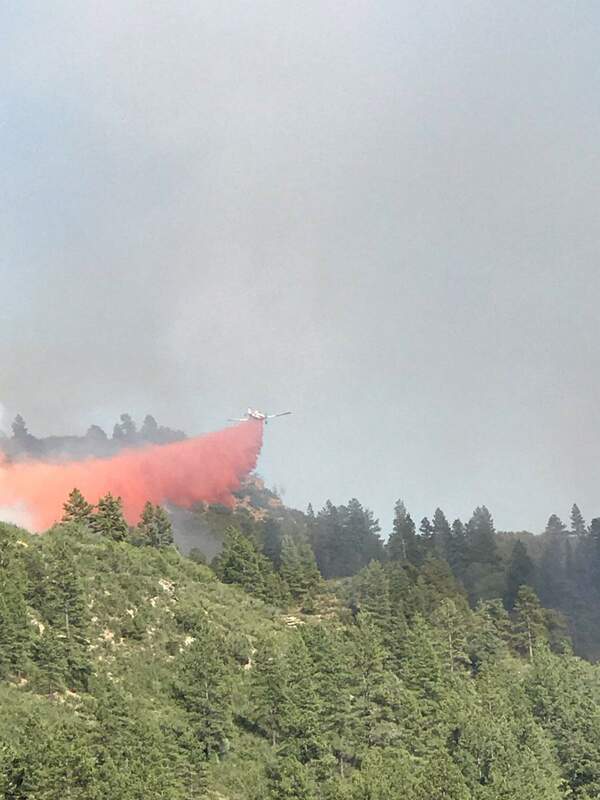 UPDATE: One fire becomes two west of Durango - 5:20 p.m.Firefighters are battling a second wildfire in the Lightner Creek area. They weren’t sure if the second one, burning east of the original fire, was caused from hot embers “spotting” and starting a new fire. The second fire was moving toward Twin Buttes, a new subdivision that is under construction west of Durango. First reportFirefighters are evacuating residents in the Lightner Creek area west of Durango for a wildfire that threatens several homes. The fire was reported shortly after 4 p.m. in the 1200 block of Lightner Creek Road (County Road 207) a couple of miles west of Durango. Homes were evacuated north of the intersection with county roads 207 and 208. Pre-evacuation notices were given to homes south of the intersection to U.S. Highway 160. 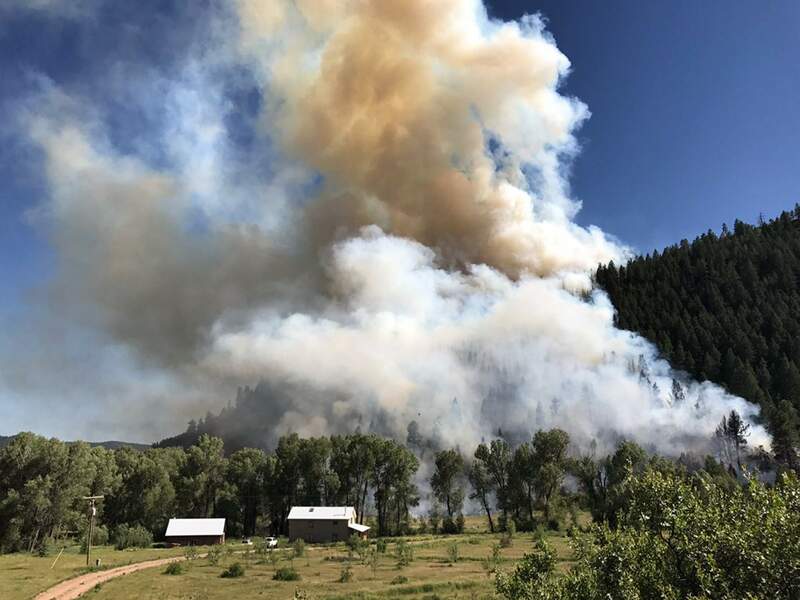 Homes along Highway 160 a mile west of the Lightner Creek Road also were on pre-evacuation notice, meaning they may need to evacuate at a moment’s notice, said Scot Davis, with Durango Fire Protection District. The blaze apparently started as a structure fire and spread to the wilderness. Flames quickly ran up a hillside and over a ridge. Gusty winds drove flames south through the Lightner Creek canyon along the west side of the road. As of 4:55 p.m. flames were a few hundred feet from Lighter Creek Mobile Home Park, 907 Lightner Creek Road, where a couple dozen homes are located. A small airplane made two passes and dropped fire retardant above the mobile home park. The fire appeared to slow as of 5:05 p.m. as the winds settled down. Lightner Creek Road was closed to public access. shane@durangoherald.comStaff writers Shane Benjamin, Jonathan Romeo, Mia Rupani, Mary Shinn and Alex Semadeni contributed to this report.